Paging, Sorting , Searching is very important when you are working with huge records. 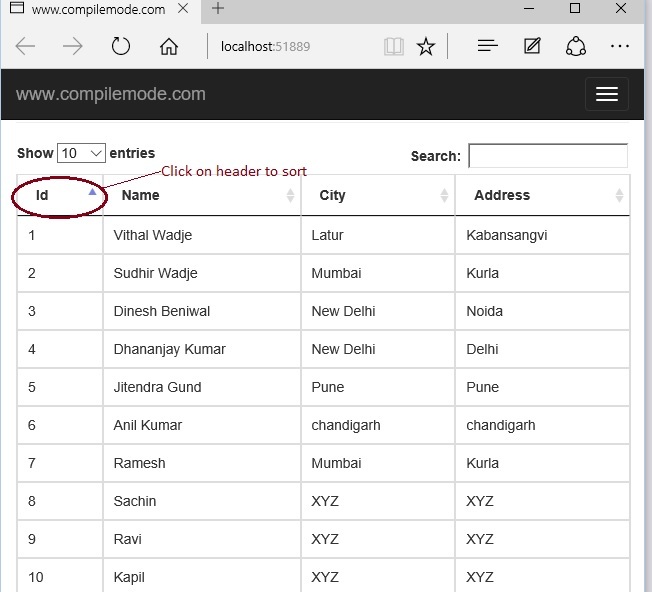 In this article we will use jQuery data table library to make efficient, responsive Paging, Sorting, Searching on html table in ASP.NET MVC with json data. So let's start step by step, so it will be useful to understand from scratch. 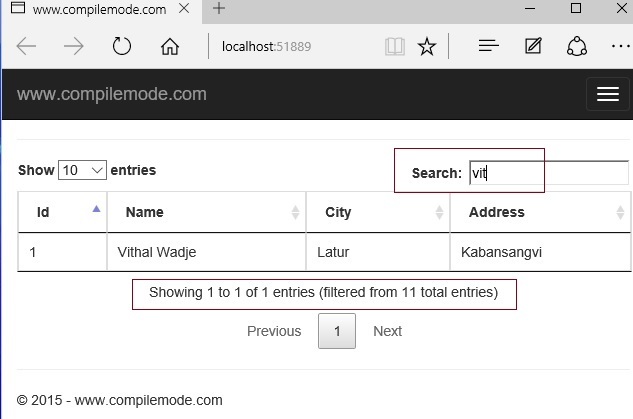 "File", then "New" and click "Project", then select "ASP.NET Web Application Template" and provide the Project a name as you wish and click on OK.
Id = 1, Name = "Vithal Wadje", City = "Latur", Address = "Kabansangvi"
Id = 2, Name = "Sudhir Wadje", City = "Mumbai", Address = "Kurla"
Id = 3, Name = "Dinesh Beniwal", City = "New Delhi", Address = "Noida"
Id = 4, Name = "Dhananjay Kumar", City = "New Delhi", Address = "Delhi"
Id = 5, Name = "Jitendra Gund", City = "Pune", Address = "Pune"
Id = 6, Name = "Anil Kumar", City = "chandigarh", Address = "chandigarh"
Id = 7, Name = "Ramesh", City = "Mumbai", Address = "Kurla"
Id = 8, Name = "Sachin", City = "XYZ", Address = "XYZ"
Id = 9, Name = "Ravi", City = "XYZ", Address = "XYZ"
Id = 10, Name = "Kapil", City = "XYZ", Address = "XYZ"
Id = 11, Name = "Vivek", City = "XYZ", Address = "XYZ"
Give the name Index, click on Add button and write the following code. After running the application the output will be as in the following screenshot without paging. 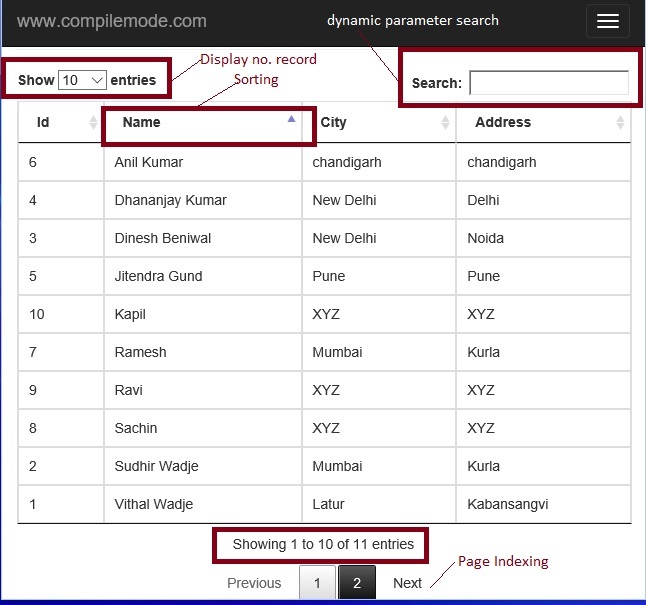 In the preceding example data came without paging, sorting and searching. 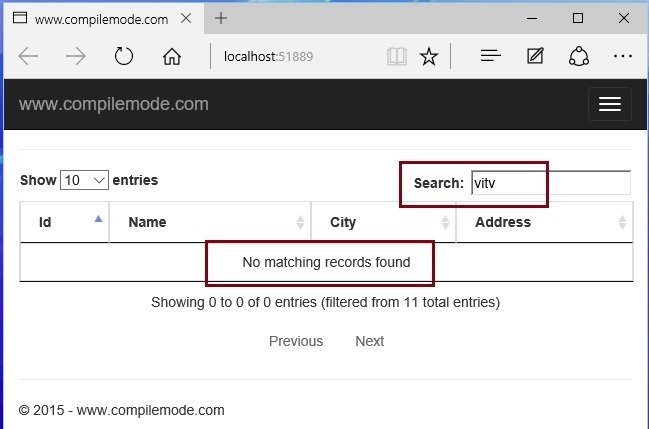 From all the above examples, I hope you have learned how to make searching, paging and sorting on html table in ASP.NET MVC with the help of jQuery data table library. 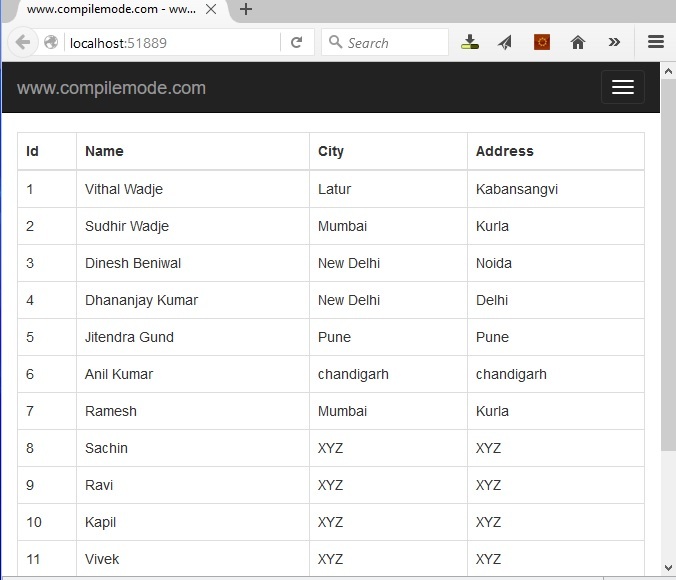 You need to use jQuery data table library. Since in this article we are using CDN library then you have active internet connection. 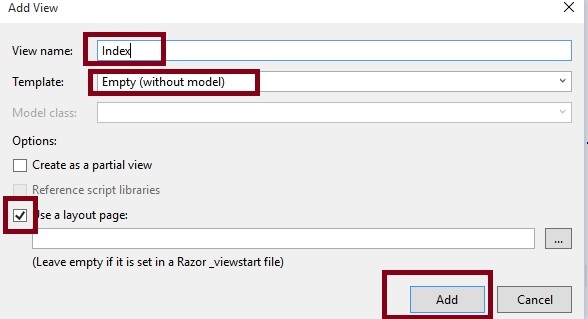 Related ASP.NET MVC Article . 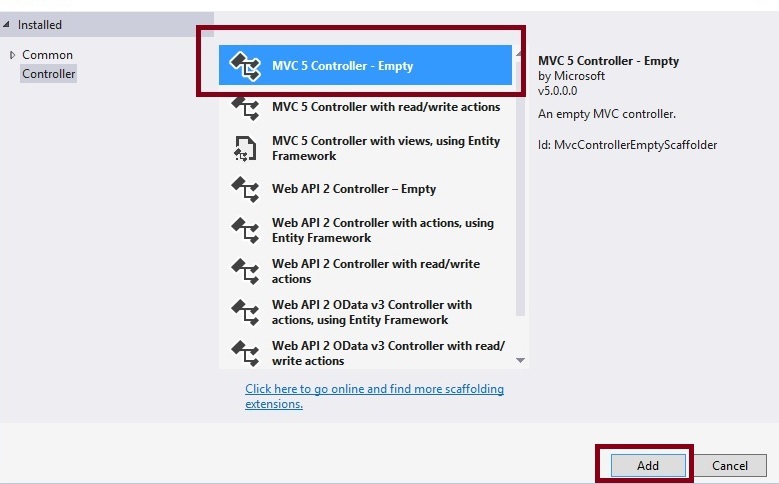 Understanding The Folder Structure of ASP.NET MVC Application .